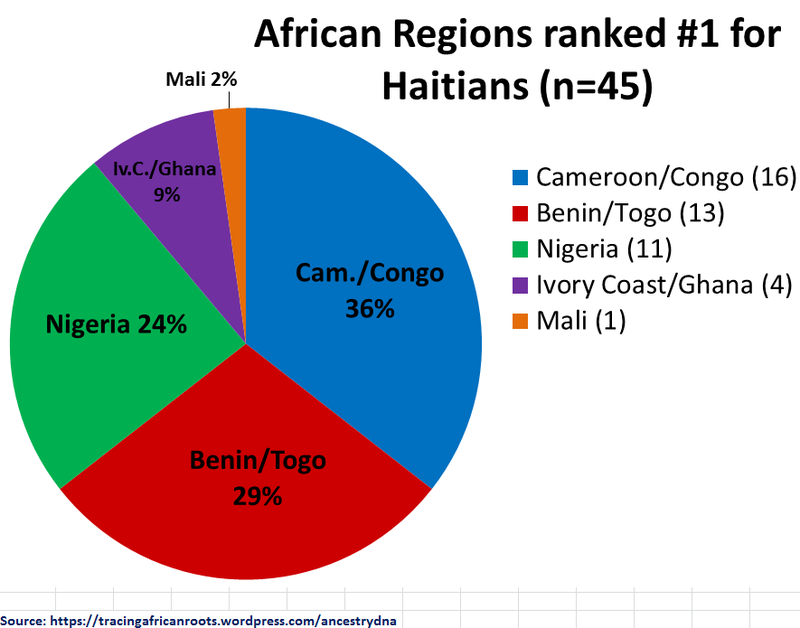 “Cameroon/Congo”, “Benin/Togo” and “Nigeria” are the most significant and consistent regions reported for Haitians sofar. Confirming what we know from documented slave trade as well as cultural retention in Haiti. “Southeastern Bantu” and “Pygmy/San” (“South Central Hunter-Gatherers”) scores might be minor for the most part, but it’s insightful in my opinion to combine them with “Cameroon/Congo” to produce a proxy of Central African ancestry for Haitians. Measured in such a way Central African ancestry would be among the highest when compared with other parts of the Afro-Diaspora (see also Afro-Diaspora AncestryDNA results: A Comparison). Upper Guinean roots (“Senegal”+ “Mali”) are largely diluted even if still detectably present for Haitians, as is the case for most parts of the Afro-Diaspora. There are a couple of higher outliers for “Mali” though. “Mali” could very well be suggestive of genuine Malian origins, “Bambara’s” being regularly documented for Haiti (see chart below). However given the imperfections of the current AncestryDNA Regions, i suppose “Mali” could perhaps also signal origins from Burkina Faso or the northern Gur-speaking parts of Ghana/Benin/Togo. Aside from other options (Guinea Conakry/Sierra Leone). The trace amounts of “North Africa” for Haitians could still be indicative of genuine ancestry from Upper Guinea or the Sahel Region. Although again also other ancestral scenario’s might apply. The average score for “Ivory Coast/Ghana” is about equal to “Senegal” + “Mali” combined. Highlighting noticeable ancestral connections with the Gold Coast and the Wind Ward Coast due to English contraband slave trade in Haiti (often by way of Jamaica). Although in fact also the French carried out direct slave trade with especially the Ivory Coast (Cape Lahou). Obviously a much greater variation and a usually more regionally mixed outcome can be observed if you closely examine each and every single individual result (see last section of this page). Also the screenshot i selected as the “average” Haitian result is naturally just based on the limited samples which were available to me. It happens to show the closest similarity and most likely also closest genetic affinity to the regional averages i have calculated for my 45 Haitian samples. Especially with regards to the total African amount (92% being both the median and mode score for my sample group) and the ranking of the first four regions. It seems a meaningful finding that sofar among my 45 Haitian survey participants only three regions produced amounts of above 50%: “Cameroon/Congo” (54%), “Benin/Togo” (51%) and “Nigeria” (53%). 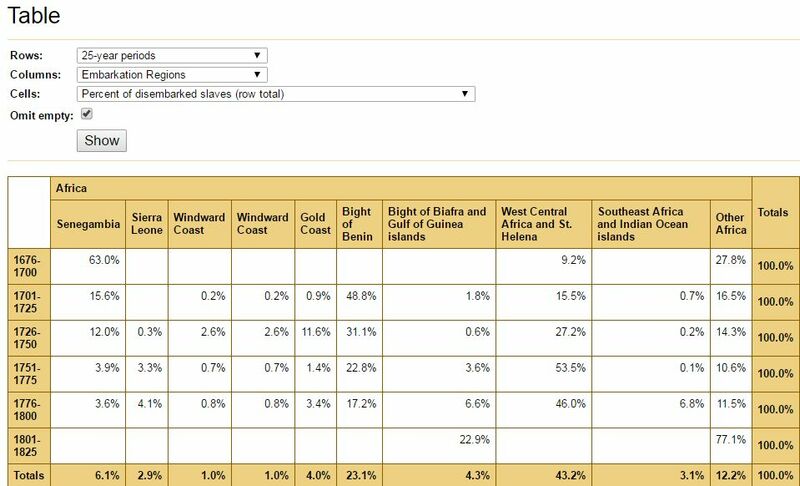 Most likely not by coincidence these are also the three primary regions when going by other statistics such as group averages (see chart 4), frequency of being the top region (see chart 3) as well as slave trade statistics (see chart 5). The chart above is intended to demonstrate the full extent of African ancestry among my Haitian survey participants. 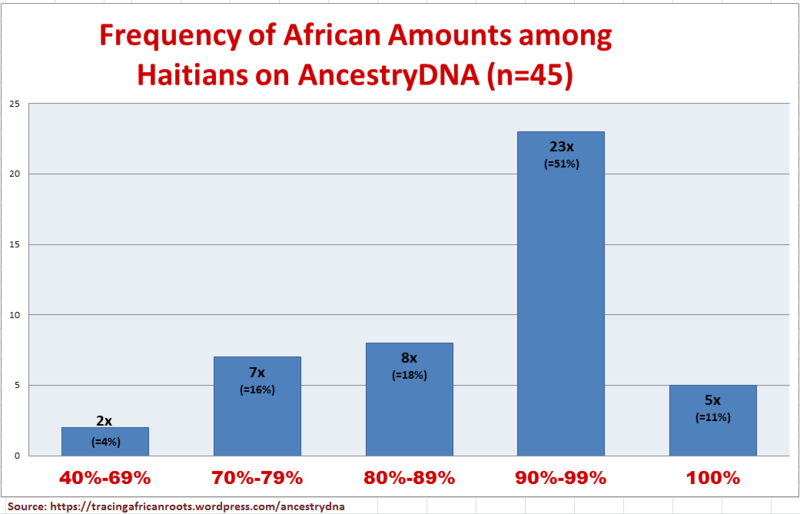 A majority of Haitian AncestryDNA testers (23/45=51%) falls within the range of 90%-99% African ancestry. Which is therefore easily the most frequent admixture interval i observed. Still at the same time a considerable number of people showed non-African admixture of inbetween 11%-30%. So generalizations should be avoided as individual variation will always exist. 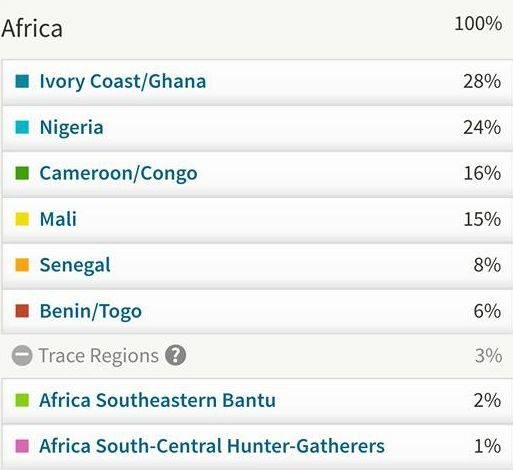 To enable group comparison i have scaled everyone’s African breakdown to 100% within my AncestryDNA survey (see also this page for further details on my methodology). 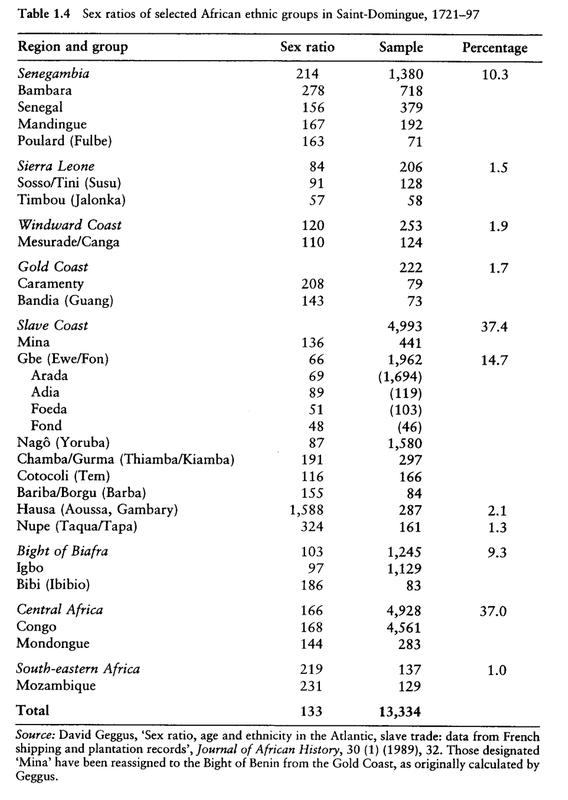 But obviously to put everything in broader perspective the original total African amounts are also still relevant. This kind of data often gets presented in a potentially misleading manner. Only highlighting the mathematical mean of all the results as the average. Which tends to downplay individual variation and obscure possibly skewed distributions. Especially atypical lower scores tend to pull down the mean. Therefore I have compiled various other statistical measures in chart 2. As shown in the chart above my Haitian sample group is clearly showing an asymmetrical data distribution. Therefore i believe the median score of 92% (50% cut-off point of all observations) is a more representative reflection of the group average than the mean of 88.5% i obtained for my Haitian sample group (n=45). I like to emphasize that no fictional national averages are implied. This graph firstmost reflects the limited sample group which was available to me. Follow this link for the source data. Even so i think that my sample size (n=45) is pretty robust already and will correlate closely to what is to be found within the Haitian genepool as a whole. As a crude rule of thumb it is often stated that n=30 is a large enough sample size for most standardized types of research. Also my samples have been randomly picked and are – as far as i have been able to tell – from various regions within Haiti as well as from various social backgrounds. Again i like to stress the number of Haitian results i managed to collect (n=45) is very small. This samplesize cannot be expected to be fully representative for a population of more than 10 million people! However as the results are randomly picked and from various regions within Haiti they could still be a rough indicator of the scope of African diversity in Haiti as well as its main tendencies. 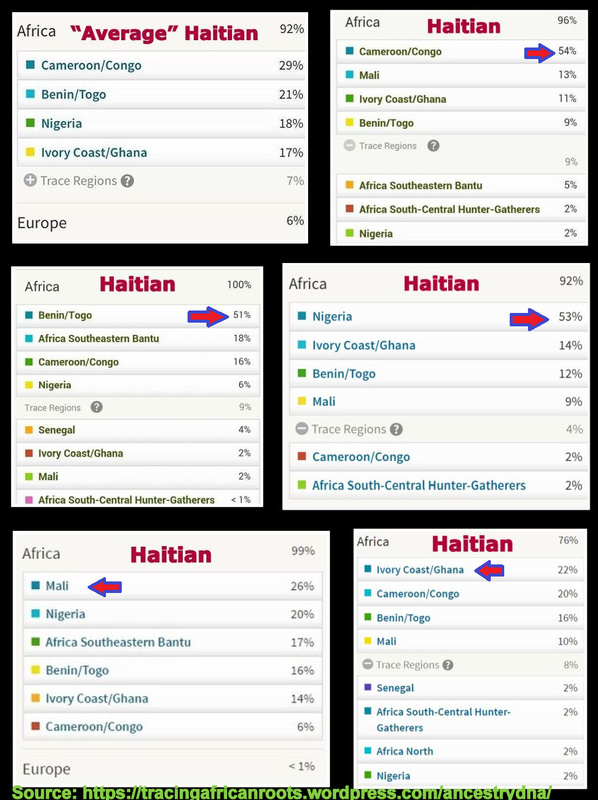 Already these AncestryDNA results might come as a surprise to people who exclusively associate Haiti’s African origins with Benin because of its well known influence on Haitian Vodou. This is however clearly a case of oversimplification as in reality Vodou is very much a syncretic religion which also contains important Congolese and Yoruba influences aside from its possibly Fon-Ewe foundations. And in fact the very concept of many different “nachons” (according to some accounts no less than 21!) in Vodou is a direct referral and acknowledgement of the various African nations who contributed to cultural retention in Haiti (see this article for a useful overview). Keeping all these basic commonalities in mind it’s perhaps still interesting to explore which African origins could be more “typical” for Haitians. What stands out for them? Not anything unique but just reported in higher frequencies or proportions. 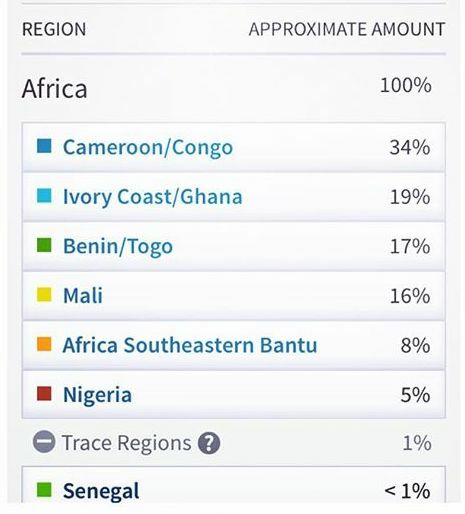 Judging from the above two charts i would say that it’s especially the higher than average “Cameroon/Congo” and “Benin/Togo” shares of total African ancestry. We can see that both components are in no way confined to Haitians alone however it clearly peaks for them when comparing with Jamaicans, African Americans, Dominicans and Cape Verdeans. Which is a nice corroboration of what you might expect. It’s fascinating to also compare with the 15 Nigerian results i have collected sofar (incl. mostly Igbo’s and Yoruba’s). 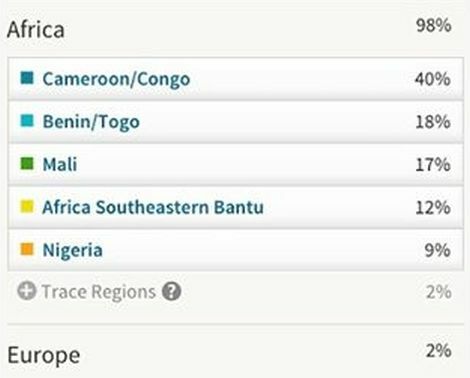 They show a slightly higher share of “Benin/Togo” but a lower share of “Cameroon/Congo” than the 45 Haitians, which proves how the DNA markers measured by the AncestryDNA regions are in fact found across borders and also among neighbouring ethnicities. Again it will be misleading therefore if you take the country name labeling too literally! It’s also useful perhaps to look at the frequency of top regions being reported for Haitians. Even when usually 3 or 4 other main regions are also showing up in the total breakdown and obviously these would also matter for a complete scope on Haitian’s African origins. 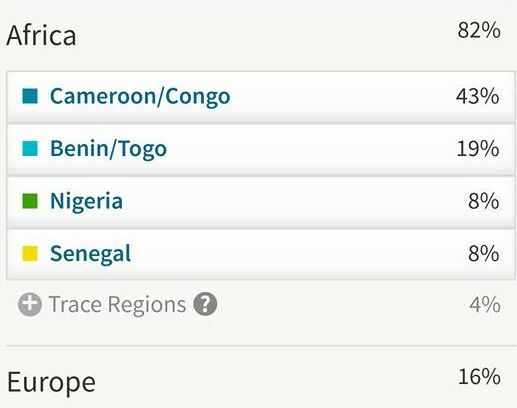 Right now of course the sample size is very limited, but it might be telling already that sofar usually “Cameroon/Congo”, “Benin/Togo” and “Nigeria” ended up as number 1 main region for Haitians. It will be very interesting to know the distribution of these nr.1 regions if the samplesize grows to 145 in stead of 45. Will “Cameroon/Congo” prove to be the main region for most Haitians still or rather “Benin/Togo”? And will the relatively high number of “Nigeria” top spots be sustained or not? Just based on informed speculation and notwithstanding a possibly even greater amount of diversity than already observed i would guess that any Haitian scoring “Senegal”, “Mali” or “Southeastern Bantu” as number 1 region will be quite rare while “Ivory Coast/Ghana” as top region might occur more often but still will be somewhat uncommon for Haitians. It’s true that Haitians have shared ancestry from Ghana with especially Jamaicans because of English contraband slave trade. However it might be exactly the generally diminished proportion of “Ivory Coast/Ghana” reported for Haitians which serves as a key difference between Haitians and African Americans/Jamaicans. That is when comparing on a population wide level, obviously there’s always individual variation. The same thing goes for “Senegal” and any noticeable difference in African origins (inspite much overlap) between Haiti & the Dominican Republic. The AncestryDNA region called “Senegal” is present among Haitians but in much diluted proportions, more so even than “Mali”. While among Dominicans the “Senegal” scores are generally much higher, often also reported as number 1 region. Starting off with a truly predominant (>50%) score for the “Cameroon/Congo” region. Such scores of above 50% for just one single African region are quite rare for not only Haitians but also other parts of the Diaspora. Among 44 Haitian results sofar i have seen 3 persons scoring 50%+ amounts for just one single African region. It seems appropriate that this 54% Cameroon/Congo” is sofar the highest absolute amount for any region i have observed among Haitians. Afterall as i have discussed in greater detail above “Cameroon/Congo” represents the least diluted regional lineage among my Haitian sample group, with the highest likelyhood of ending up as top region. And actually chances are high that this person has an even greater Central African heritage when you also add up the 5% “Southeastern Bantu” and 2% “South-central Hunter-Gatherer’s”. This result below shows the second highest “Cameroon/Congo” score sofar. Combining with the 6% “Southeastern Bantu” it might imply about half of this person’s origins being from Central Africa. However technically speaking also some Biafran/Cameroonian origins might be included. The “Nigeria” score is afterall also quite considerable. Interestingly this person is from Northwest Haiti & Tortuga. Compared with other regions in the country the northern part of Haiti might have received the largest proportion of captives from Central Africa, more than 50% of the total according to Geggus (2001) (see also this chart). 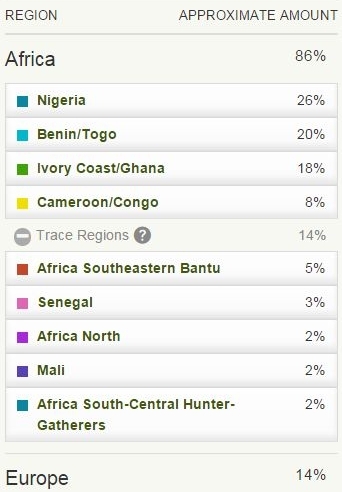 Below breakdown is yet again showing a combination of “Benin/Togo”, “Cameroon/Congo” and “Southeastern Bantu” but with a notable 17% “Mali” added in as well. 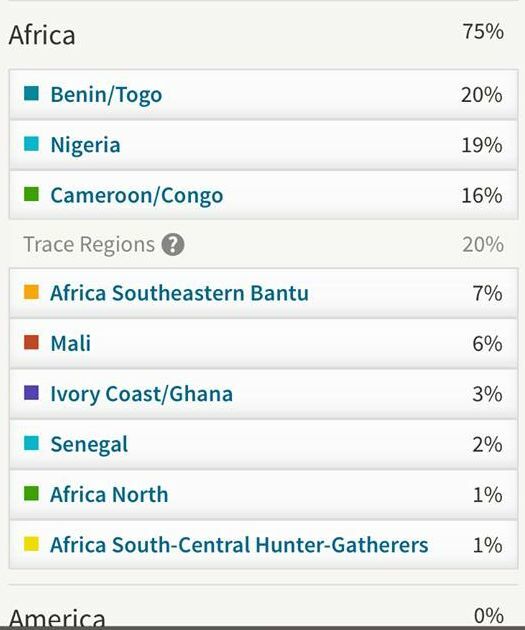 Because of the absence of any significant “Ivory Coast/Ghana” and “Senegal” it may be that this kind of composition could be more easily distinguishable from both Anglo-Caribbean and African American results. 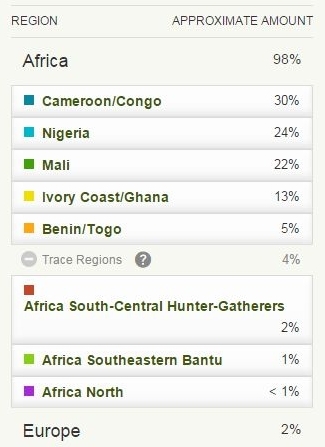 Aside from a prominent “Cameroon/Congo” percentage also the “Southeastern Bantu” score is significant. Combining them together it could imply more than half of this person’s African roots could be from Central Africa. Aside from a high “Cameroon/Congo” percentage also a striking “Ivory Coast/Ghana” score to be seen for the next three results. Two of them also noticeable for showing a regionally balanced 100% African result, possibly covering all known areas of origin for Haitians, from Senegal to Mozambique. 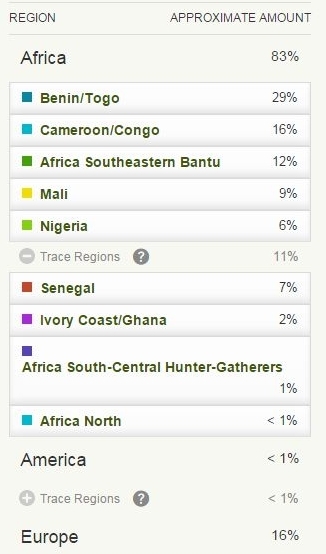 Aside from a high “Cameroon/Congo” proportion, also a very noticeable “Mali” score of 22%! Again high “Cameroon/Congo” combined with “Mali” in second place. A very similar breakdown, especially with the top 3 ranking being exactly the same. 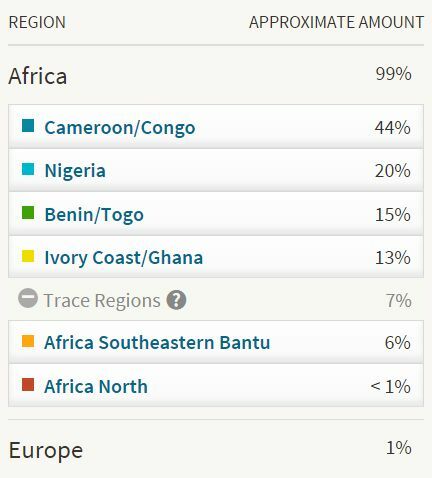 Because this person has some minor European admixture actually the relative “Benin/Togo” contribution is even greater: 50/92= 54%. 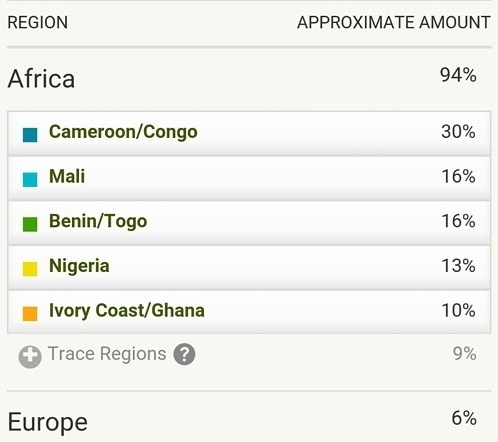 With 44% “Benin/Togo” out of 78% African the result below shows the highest regional contribution i have observed sofar for “Benin/Togo” among Haitians: 56% (44/78). Even more predominant therefore than the previous result, relatively speaking. Again a striking combination of “Benin/Togo”, “Cameroon/Congo” and “Southeastern Bantu”. MY ANCESTRYDNA RESULTS ARE IN! The highest “Nigeria” amount i have observed sofar and also only the third >50% score for just one single African region. Truly predominant. More research needs to be done in order to establish which Nigerians ethnic groups contributed the most to such “Nigeria” scores for Haitians. However i suspect that compared with other parts of the Diaspora Haitians might have the most diverse Nigerian origins. That is going by historical records and some (very) preliminary DNA matching patterns. Most likely tending towards western Nigerian and especially Yoruba ancestry in the first place. However also eastern Nigerian, and especially Igbo roots, are bound to be significant as well. And furthermore northern Nigeria, especially the Hausa and Nupe, might very well have left their greater genetic legacy among Haitians, aside from among Bahians in Brazil. 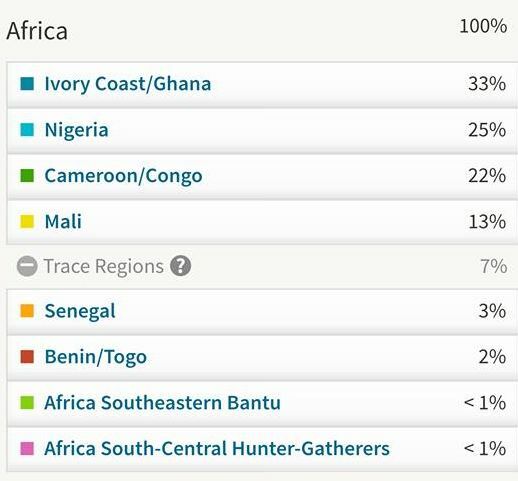 All these diverse Nigerian origins might very well be included at the same time in the impressive 53% “Nigeria” score shown below. The highest relative “Nigeria” contribution in my survey up till now can be seen below:49/77=63% out of the African breakdown. In the three following screenshots below “Nigeria” as nr.1 main region is combined with “Benin/Togo” in second place. 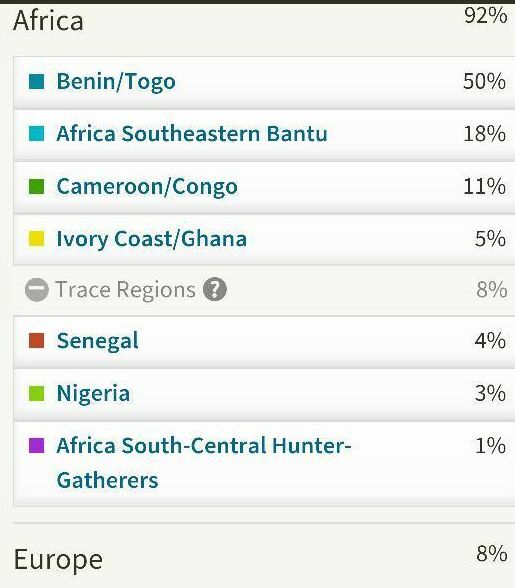 The following results belong to a person with 2 Haitian born parents but 1 grandparent being from Italy. The African breakdown was inherited solely by way of Haitian ancestors so it will still be representative for the purposes of my survey. The regional contribution of “Nigeria” is actually among the highest i have observed sofar: 27/55 being 49% of the total African amount. Not shown in the screenshot but in addition this person also scored 12 % West Asian. 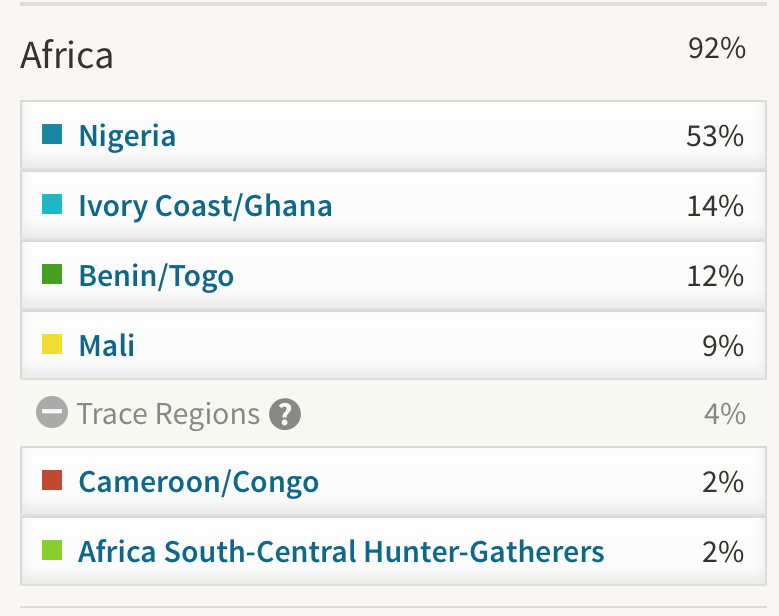 One of the main outcomes and perhaps even surprises of my survey of Haitian AncestryDNA results has been the considerable level of “Ivory Coast/Ghana” amounts being reported. In a few cases “Ivory Coast/Ghana” even shows up as biggest region. Although sofar not really in a predominant manner. Aside from Ghanaian/Ivorian ancestry actually also Liberian or even Sierra Leonean origins might be hinted at by this region. The following two screenshots directly below are remarkable for several reasons. They belong to two siblings from northern Haiti. First of all the prominent “Ivory Coast/Ghana” postions are notable of course. Because this does not happen all too often for Haitians. Although perhaps more frequently than people might expect. Secondly eventhough 100% African scores are probably not going to be uncommon for Haitians (when larger sample groups become available) it is still interesting to come across such scores among the Diaspora. Still it should be pointed out that these breakdowns are very much evenly spread out across several regions, unlike those reported for native Africans. Aside from the highest amount being reported for “Ivory Coast/Ghana” this breakdown below is actually again quite balanced. Also showing considerable additional scores for “Cameroon/Congo” and “Benin/Togo”. Regions which might be deemed more “typical” for Haitians. Also interesting how the European breakdown is seemingly pointing towards Northern European admixture. This could in fact still include French ancestry as the French ethnicity is basically a mixture of Mediterranean, Celtic and Germanic inputs. The only Haitian result sofar i have seen with “Mali” being reported as top region. Just another reminder that the African roots of Haitians are more diverse than sometimes assumed. Also the “Southeastern Bantu” amount is noteworthy in this regard. When it comes to interpreting the “Mali” region there are several possibilities, incl. Gur speaking origins from Burkina Faso and northern parts of Ghana/Togo/Benin. However judging from documented slave trade records it seems that any chances of genuine Malian ancestry might be highest for Haitians when compared with other parts of the Afro-Diaspora. An even higher “Mali” score for the next result, even when not being reported as top region. In fact with 29% it is the highest “Mali” amount i have observed sofar in my survey (n=44). It will be very interesting to see how Haitian results compare with other French speaking parts of the Caribbean. Sofar i have not come across many except the ones shown below. 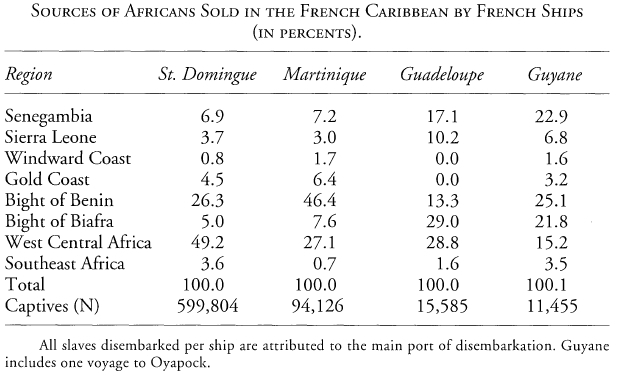 According to documented slave voyages Guyane together with Guadeloupe might have a noticeably greater amount of Upper Guinean ancestry than Haiti. However this is not showing up in these individual results. 1) Does my high Ivory Coast/Ghana point to Sierra Leonean/Liberian ancestry directly from the continent or from contraband slave trade? 2) Can Cameroon/Congo (my 2nd highest region) be interpreted as Bantu (Kongo)? 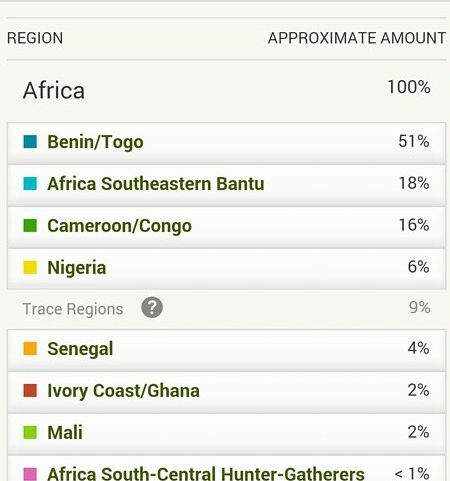 3)Does my Nigerian result (10%) confirm Yoruba ancestry when tied with my Benin/Togo result (11%)? *DISCLAIMER*: Like many other Caribbean people, I have ancestors from other countries. The other country I know other Afro-descendant ancestors came from is the Dominican Republic (on my paternal grandmother’s side). I’d really appreciate it if you could help me out with this. Hey Sid, thanks a lot for your comment!I loved your video man! Incl. the background music haha. Those are very good questions, unfortunately i don’t think they can truly be answered with 100% certainty so this will just be my 2 cents! 1) The considerable average score for socalled “Ivory Coast/Ghana” is one of my main survey findings. You are one of 7 Haitians out of 56 right now who have this as biggest African region. As i mention on this page i suspect contraband slave trade by the English accounts for a great deal of this outcome. Because the French themselves did not visit these parts of West Africa that much (see the slave trade charts i posted above). However in individual cases i cannot be sure. I think your best bet is to closely look at your matches. Do a search on birth location and type in such countries as Jamaica, Barbados, Saint Kitts, Antigua, Dominica, Virgin Islands (these were some of the main transit points for contraband trade in the Caribbean). I am actually very fascinated in this cross Diaspora matching so i would really appreciate if you could tell me the number of matches for each of these countries (you can also tell me for DR, Cuba and Brazil)! I happen to share profiles with several Haitians and i am able to perform the same search so i can tell you how your Diaspora matches compare with other Haitians. This could be insightful. For example say you have about 20 Jamaican matches while the Haitians i’m sharing profiles with only have about 5, this will increase the likelyhood of your Ivory Coast/Ghana being the result of contraband trade. Eventhough still also other ancestral scenarios might then apply. At the same time i would advise you to also regularly do a search for Africans among your DNA matches. 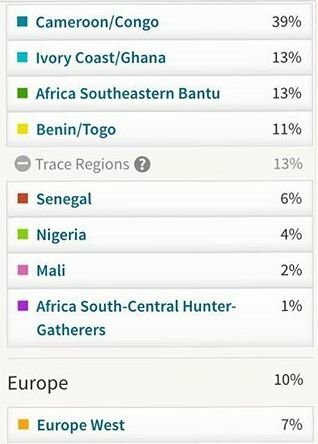 You can either carefully browse through each of your pages and look for any matches which seem “African” because of their profile names or the preview of their ethnicity estimates being 100% African. Another way is to search for birth location and type in countries like Ghana, Ivory Coast, Sierra Leone, Liberia, Democratic Republic of Congo, Nigeria, Ghana, Benin, Cameroon,, Senegal etc. etc. The number of Africans who are taking AncestryDNA tests is small but steadily growing. So the chances of eventually finding an African match will increase with time. Keep in mind though that finding an African match doesn’t per se mean you or your MRCA (most recent common ancestor) share the same ethnic origin as your match. Without any paper trail there will always be several ancestral scenarios which may be valid. 2) As i mention on this page i do think that Congolese roots for Haitians are generally speaking widespread and primary. The Cameroon/Congo region is in itself ambigious as it might also suggest (partial) connections with Cameroon or even southeastern Nigeria. However in the case of Haiti statistically the chances for it being Congolese ancestry will always be greater. Especially with such high amounts as you scored i would assume it’s almost inevitable that at least a portion of it will trace back to Congo or just Central Africa. 3) Yoruba or Nago origins for Haitians will again be widespread generally speaking. However several other surrounding ethnic groups also are known to have arrived in Haiti and they might also have given you both “Nigeria” and “Benin/Togo”. Also you have to keep in mind that most of your African born ancestors probably are to be traced back to the second half of the 1700’s. So that’s at least 6-8 generations ago and each individual ancestor would have given you a DNA inheritance of about let’s say on average 1/64=1,5%. It could be more or less in individual cases but certainly not more than 5%. 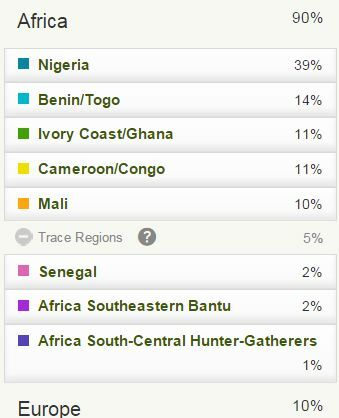 Now going back to your 10% Nigeria + 11% Benin/Togo it is practically impossible for it to be traced back to 1 single ancestor (unless you have very recent African migrant ancestry). Instead it will represent at least 5-10 individual African-born ancestors going up to 20-25 separate persons perhaps. The chances of some of them being Yoruba are indeed going to be high, but i would certainly not rule out the possibility that also other types of ethnic origin might be included in addition. I sent you the invite. Thanks for the useful info! Interestingly enough a lot of my grandmother’s cousin matches or Dominican, even more so than Haitian. I had a few Jamaican matches but under 10. Great work Felipe ! I’d suggest you to ask to the people who sent you samples to notify you where their family are from in Haiti. Since it’s a small country, it would be fun to see if their concentration of certrain group in a region. There are of course plenty of circumstances which go against a straightforward interpretation though. For one this chart doesn’t include illegal slave trade with the English and obviously it also doesn’t show what happened with African captives after they landed in a certain place. For all we know the South might mostly have imported slaves by way of western slave ports for example. Would still be really great though to see if any correlation can indeed already be found with my still limited sample group. Although again any outcomes will be hugely approximate;-) Judging from the family trees some people have kindly shared with me many Haitians who were born in the capital will probably have regional origins from across the island going back only 2 or 3 generations already. Let alone 7-10 generations ago which would be the relevant timeperiod to compare with. Still some people’s families, especially from rural areas i imagine, might have been less inclined to migrate across the generations and will have deep rooted origins from just one particular region. I have already added an extra column in my sheet. Just to keep things simple i’m only keeping track of family origins from the North, Centre or West and the South. These maps below will show how i interpret these regions. Again it will be very approximate as many people might not know the birth places of all their grandparents etc. If you (or anyone else reading this comment) have more suggestions on how to do this regional survey please feel free to let me know! I actually also would love to know are there any regional stereotypes among Haitians to be correlated with their African origins? For example similar to what you have in the USA where people might say that South Carolina has a greater concentration of people with close to zero non-African admixture. Especially among the subgroup of the Gullahs and to be contrasted with the much more evenly mixed Creoles from Louisiana. Or also that Virginia is the state where most Igbo ancestry could be concentrated. In analogy is there any particular region in Haiti which is associated with the greatest degree of total African ancestry? Or also is there any region which is noted for having the greatest share of mixed-race people? Are there still any African ethnic stereotypes or popular sayings which are more frequent in local folklore for one region rather than the other?. For example i happen to know that there are still some lingering sayings about the Congo’s, are these more typical for a certain region or are they just nationwide? This seems like a really fascinating topic. Especially with the various nacions being linked with specific Vodou rites it would be so insightful to know if perhaps there is any regional correlation within Haiti, whereby some nacions are more represented locally than in other places. Eventhough from what i’ve read Vodou is basicaly a syncretic religion throughout the country. Correction, I have a fat finger. I am from PauP but my family originated from the south. 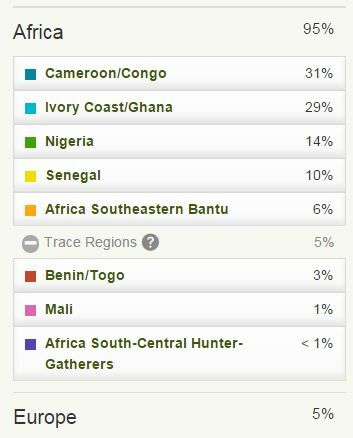 My DNA chart from ancestry showed 27% Benin/Togo, 24% Mali, 12% trace African regions, 17% Iberian, 13% British Isles, 9% trace Euro regions. I have 7 matches through Ancestry DNA that were born in Haiti and whose family is Haitian. Does this mean that we all share at least 1 MRCA from Haiti? Was anyone from Haiti as a MRCA? What is your own background? Are you African American yourself? Theoretically there will always be several scenario’s which might apply when you get matched with someone. Personally i think it’s wise to avoid jumping to conclusions. Although corroborating evidence can always add to plausibility. Have you tried yet to see if these matches are also related among themselves? There’s the “shared matches” feature on Ancestry which might be helpful. And of course if these matches are also on Gedmatch you will have several additional tools to determine shared segments of DNA and also triangulation would be an option. Growing up I was told that I had Haitian grandparents on both sides, but I never met them before they passed. I’ve done GEDMatch and I do match with the ones who’ve done it, but the other ones haven’t done it yet. We only match on Ancestry fkr the latter. Are you in any of Ancestry’s Genetic Communities? From what i’ve seen people of Haitian descent tend to get “African Caribbean”. Hopefully with an upcoming update a separate Genetic Community of Haitians will be created.